There are new updates in Oracle Public Cloud portal. Now there are new Alerts which lets one set notifications for the quota usage. These notifications are both for Metered as well as Subscription based Non Metered PaaS services. Below are the steps to set Alerts and notifications in Cloud Public Portal for PaaS Services. Step 1 : On the Dashboard, Click on Estimated Balance of the services for which you want to set new alert. 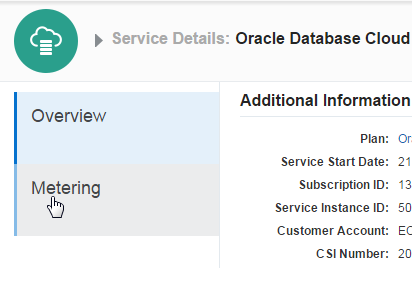 Step 2 : Check the Amount for Database Public Cloud Service. This is total available credits. Suppose this is X amount. We will set an alert on 80% of X. Step 3 : Again from Dashboard, Click on Details of the service where we need to set an Alert. Step 4 : Click on Metering. There is a Value Type field where we can select Absolute Number or Percentage. If we select Percentage, then there will be a notification sent when that % of credits have been consumed. The other field added is Limit Type. It has two options. Soft Limit & Hard Limit. Soft Limit : There will be a notification email once the Usage Limit is reached. Hard Limit : There will be a notification email stating that “Services have been suspended “once the Usage Limit is reached and services will be Suspended. There will be details of the suspended services. If there is a Hard Limit alert and consumption has reached the Limit, along with suspension of services it will also restrict to create any more instances. Also there will be quota breach Red Sign in front of services in the dashboard as shown below. My personal experience about this blog is that to know much about the oracle this is the right place. To hire more regarding the oracle will be enough here. Wow what a cool blog you have here! I am impressed. You really put a lot of time and effort into this. I wish I had your creative writing skills, progressive talent and self discipline to produce a blog like you did. Your blog really does deserve an honest compliment.